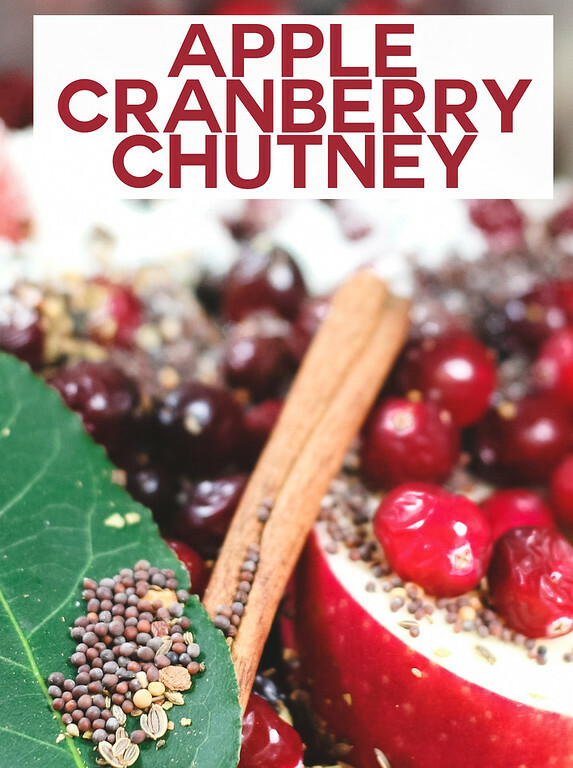 Apple Cranberry Chutney – an apple chutney gets even more fall flavor with cranberries! Every time I serve this, every one asks for the recipe, it’s that good! Apple, cranberries, cinnamon, bay leaf, pickling spice, mustard seeds, sugar, ginger, apple juice and apple cider create an unusual and amazing homemade cranberry sauce. Click here to pin this Apple Cranberry Chutney now! Well, you know what time it is, don’t you? It’s time for the bags of cranberries to start appearing at the grocery store. Which means, it’s time for you to use the stash of frozen cranberries in your freezer. You do have a stash of frozen cranberries don’t you??? I personally keep at least 7 in my freezer at all times, I’m not sure why, perhaps I have deep, hidden fear of running out of cranberries. I also like to start experimenting with different homemade cranberry sauce recipes. I don’t want to try something new on the big day, so we start eating cranberry sauce at the beginning of November! Which is how I discovered this unusual, but so delicious cranberry apple chutney from Tyler Florence, Stirring the Pot. This recipe is so good! With the chutney being pureed, it almost has the consistency of an apple sauce. Really, everyone loved it and kept trying to guess what the ingredients were! So good! 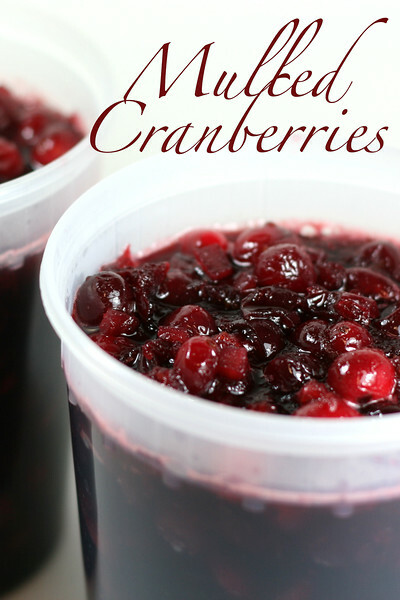 Perfect for Thanksgiving or Christmas, or anytime if like me you hoard cranberries! We make these Brandied Cranberries every year! 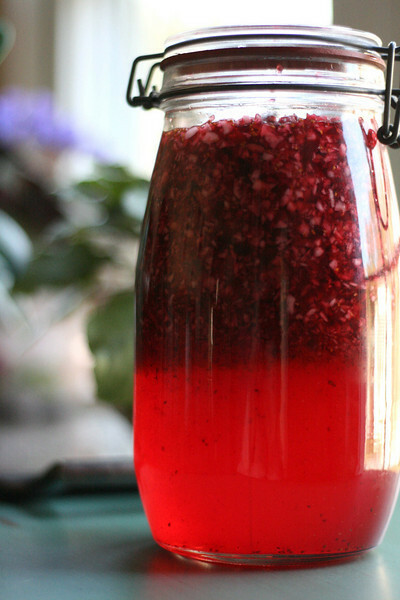 We also make this Homemade Cranberry Liqueur every year, makes a great gift too! Mulled Cranberry Sauce because apparently we like cranberries and alcohol a lot! 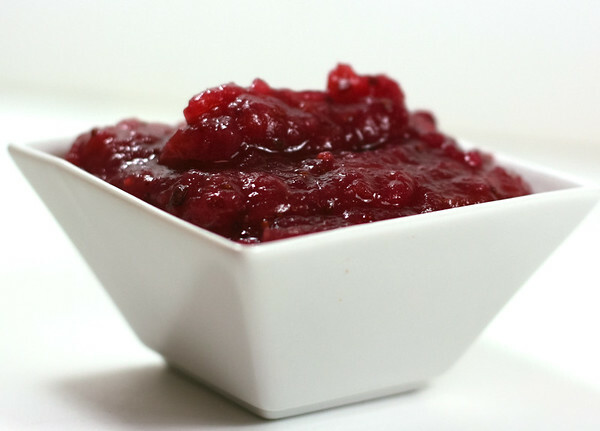 Try this Apple Cranberry Chutney instead of cranberry sauce! Combine all of the ingredients in a large saucepan. Simmer for 25 minutes, until the apples are almost falling apart and the sauce is fragrant. Remove the bay leaf, cinnamon stick, ginger, and discard. 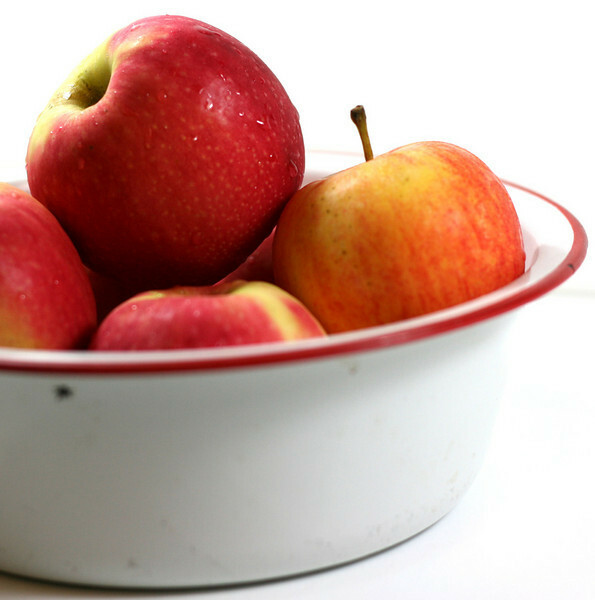 Place the apple mixture in a food processor, and process until it is thick and smooth. Your Apple Cranberry Chutney looks delicious! Thanks so much for sharing with us at Full Plate Thursday. Come to next weeks Thanksgiving party on Tuesday at 8:00 am, CST, see you then! I must get some cranberries. This looks tempting. Given a choice between an orangish cranberry chutney and a red one, I’d pick the red one. Cranberries are not orange! Cranberry (and cranberry apple) chutney was my first canning project last year. And wow. Delicious. No other word. I love it. I don’t have cranberries yet, but hopefully in a month or so… I keep mine on the tart side. And I think there might be one more jar left from last year! Humm…. Gorgeous pictures! I only have 2 bags of cranberries in my freezer–I feel like I should go buy more now! 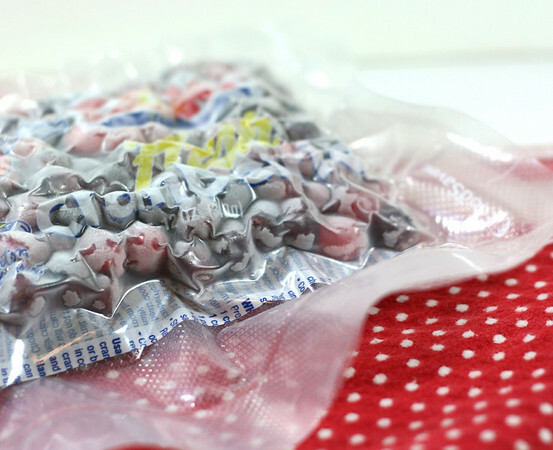 I’m a cranberry hoarder, too — my freezer always has three or four bags. We live in cranberry country, and it’s such fun to drive around at this time of year and see the cranberries floating on the bogs, waiting to be harvested. Chutney is always wonderful. This sounds so tasty. It is one the list! This is on my list of Tyler recipes to try! I love cranberry season. I tried to stock up last year but was a bit late in doing so. Thankfully, the Whole Foods around here have frozen cranberries year round. Not as good as freezing them yourself, but better than nothing. Yay for fall! I love your presentation of this. girli – me too! I love fall. Joy – yep you spotted the famous bay leaf. Barbara – all the cool people have cranberries in their freezer. Hip chick – let me know if you like it! Kim – I know, I can’t figure out the whole orange thing either. 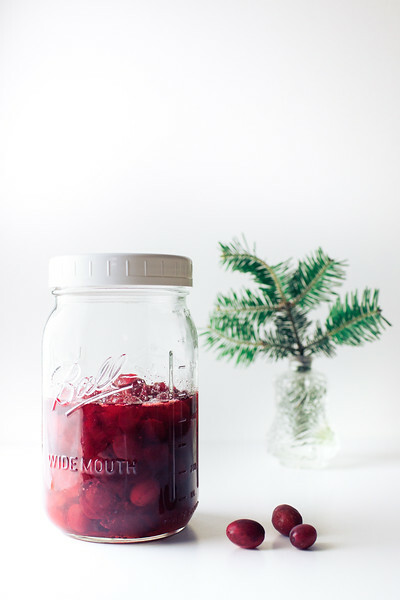 Marjie – yep, time to start your cranberry stash over. La Table – yes, it was really yummy. Natashya – the pickling spice does add an extra unusual kick to it. Ty’smommy – next time you buy a bag of cranberries, buy too and store one in the fridge. It will make me feel better. Tale -it did smell so good all simmering on the stove. Jenn – thank you. It does look like fall in a pot doesn’t it? Michelle – it is so good! Antoinette – cranberries and soup, both mean fall to me. Buffalo – there are some fruits that I won’t mix with meat, like peaches. Ick. 5 star – like I said, it came off more like a cranberry applesauce. Good yarn – try it, and let me know if you like it! Paula – my mom has a food saver and uses it ALL THE TIME and loves it. Now this is a chutney I could eat – no onion or garlic or chilli. My family would love this chutney because it is pureed! Your photos are just gorgeous! I’m funny about fruit on meat and poultry.. my wife loves it on turkey! Oh, that sounds deliciously like fall — and we will be getting a few days of it starting tomorrow! Thanks. OH MY…makes me want to go right out and get some cranberries! mmmmmmmmmm i can smell it from here!! I’m back … this time the pictures loaded without any mishaps! Yeah! And, what pretty pictures they are, too. Are those cranberry’s sealed in a foodsaver bag? If so, I’d love to hear your thoughts about that. I’ve thought about getting one on and off for a couple of years, but haven’t taken the plunge. I think I’d take better advantage of freezing goodies if I had a system. That first photo is so beautiful. One of the BEST food photos I have seen in a while. Yay for chutney! Ohmigosh Pam, this looks fabulous! Nothing signifies the beginning of the fall/holiday season to me like cranberries. I’m so sad though, I DON’T have cranberries in my freezer! I’ll have to settle for store bought because I definitely need to try this! Pickling spice – sounds intriguing! 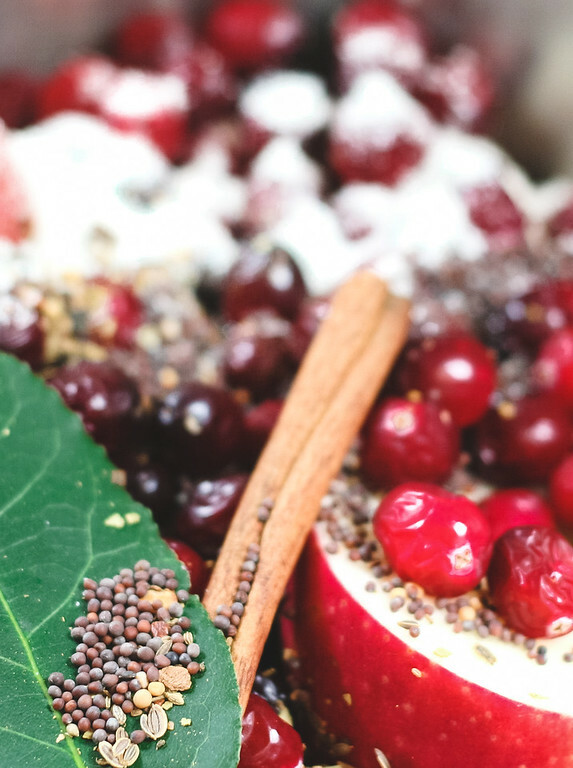 My daughter and I are huge cranberry sauce and cranberry chutney lovers – I think I may follow your example and try to stock up on this versatile fruit! Do you think this would be a good cranberry sauce for our Turkey on Sunday? Yes, everyone should own a copy of Stirring the Pot 😀 I’m busy wondering how Tyler’s sauce is orange? It makes sense that it would be red, like yours. I’m glad to hear you liked this. I’ve been trying to source out a fresh ham and have been having trouble. I think I might serve this over the holidays. Waaah! The pictures won’t post on my computer! Now I’ll never know the difference between ham and ham roast. Nevertheless, I’ll be adding cranberries to my grocery list! three cheers for apple-cranberry ANYTHING! sauce, chutney, red, pink, orange, no matter–this rocks! Never mind what the difference between ham and “ham roast” is. I’m sure it was wonderful. And I guess it’s time for me to use the last couple of bags of frozen cranberries, too, eh? Yummers! I’m going to try that one. Funny! Yes, I do have cranberries in my freezer. Does everyone? The chutney looks super good! I recognize that bay leaf.